Laura Chapot and Quointreau un Prince. Photos © Sportfot. Wellington, FL – March 19, 2017 – USA’s Laura Chapot took first and second place in Sunday’s $35,000 Suncast® 1.50m Championship Jumper Classic to conclude week ten at the 2017 Winter Equestrian Festival (WEF) in Wellington, FL. Chapot was aboard Quointreau un Prince for the win, and also guided Thornhill Kate to second place. Course designer Michel Vaillancourt (CAN) concluded his duties in the International Arena for week ten with 47 starters in the 1.50m competition and 11 to jump-off. Out of six double clear rounds, Chapot first took the lead with her own and McLain Ward’s Quointreau un Prince in 34.79 seconds. She then jumped into second place aboard her own and Mary Chapot’s Thornhill Kate with a time of 35.88 seconds. Kent Farrington (USA) finished third, riding his own and Tanma Corp.’s Dublin through the timers in 36.69 seconds. “I am thrilled,” Chapot said of her result. “I thought both horses were really on their game today, and they jumped fantastic. The jump-off was really fast, so I just took a big shot at it, and they came through for me. Chapot has had Quointreau un Prince, a 13-year-old Selle Francais gelding (Diamant de Semilly x Rosire), since he was five years old and knows the horse extremely well. “Prince” was also given the week ten Champion Equine Insurance Jumper Style Award, presented by Laura Fetterman. Thornhill Kate is a 12-year-old Irish Sport Horse mare (Courage II x Clover Hill) that Chapot has had for just over one year. While Quointreau un Prince was always a naturally fast horse, Chapot has been working on developing Thornhill Kate’s speed. Chapot plans to compete Quointreau un Prince, Thornhill Kate, and her other top mount ISHD Dual Star through the final weeks of WEF competition. She will then give her string a long break before gearing up for the Devon Horse Show in Pennsylvania at the end of May. Also competing in the International Arena on Sunday, Sam Walker and Twan won the $10,000 Hollow Creek Farm Medium Junior Jumper Classic. The $10,000 Equiline Medium Amateur-Owner Jumper Classic concluded the day with a win for Reid Patton and Twisther. Kat Fuqua of Atlanta, GA guided Small Suggestion, an entry owned by Iwasaki & Reilly, to win the championship of the Animo Medium Pony Hunter division. Throughout the winter circuit in Wellington, Fuqua has ridden the medium pony to several good placings; however, the tricolor ribbon had eluded them. The pair won the conformation class and the handy trip and placed sixth in an over fences round to clinch the championship title. Fuqua trains with Elizabeth Reilly and Keri Kampsen and started showing Small Suggestion during the summer of the 2016 season. While both Zayna Rizvi of Greenwich, CT and Augusta Iwasaki, of Calabasas, CA earned 17 points in the division, Rizvi walked away with the reserve title because she earned more points in the over fences portion. All 17 points of Rizvi’s were collected from over fences classes and Iwasaki amassed 16 points over fences aboard Isabella Griffin’s Happily Ever After. Rizvi rode Smallwood Mystic, owned by Peacock Ridge, LLC, to win an over fences class, place third in the handy, fourth in another over fences, as well as fifth in the conformation. 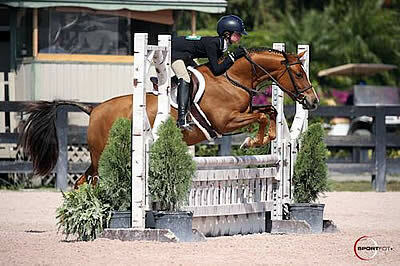 Smallwood Mystic is an eight-year-old Welsh Pony Cross gelding by Mapleside Wish List that Rizvi has ridden since 2015. The pair has seen much success during the 2017 winter circuit, winning the championship ribbon during weeks five, six, and eight. The Winter Equestrian Festival continues in its eleventh week of competition on March 22-26, 2017. For more information and full results, please visit www.PBIEC.com.